As a regular reader of The Morning Paper, I’m sure you’re technically savvy enough to know not to use the same password across all the websites you use. To make good quality site-unique passwords practical therefore, you probably use a password manager. Maybe you remember that slight feeling of unease you had when you first started using one, since it puts all of your passwords in one place (and then for many password managers, syncs that ‘one place’ across devices and the cloud). Still, it’s better than the alternative right? 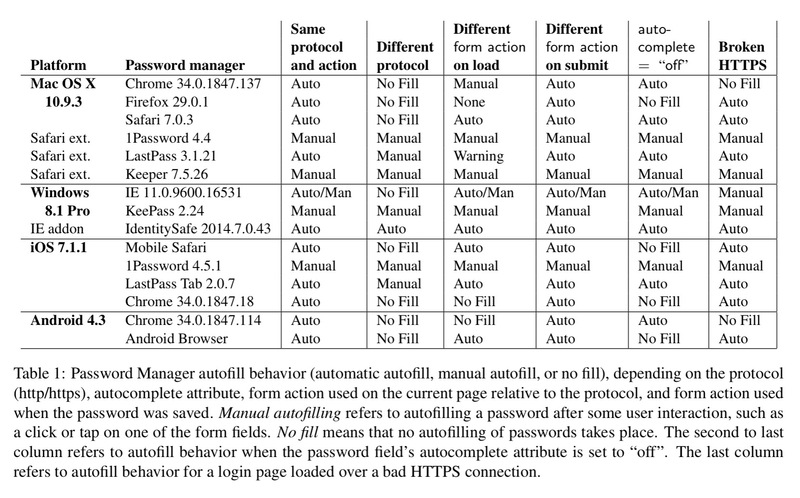 In ‘Password managers: attacks and defenses,’ Silver et al. show us that many password managers contain one major vulnerability. Unfortunately, that vulnerability is the fact that they can be used to (auto)fill in password fields! Since this is a 2014 paper, it’s possible several of the attack vectors described have subsequently been closed (if you know of an updated report on this, please let us all know in the comments). My suspicion is that variations of these attacks remain. TL;DR – don’t use autofill. The attacker is assumed to be able to enact an active man-in-the-middle network attack – i.e., to interpose and modify arbitrary network traffic originating from or to a user’s machine. However, there is no requirement that the user explicitly visit or login to any particular site in order to steal the credentials for that site. A rogue wifi router in a coffee shop (for example) is all that is needed – connect to it and your passwords could be gone. We call this type of attacker the evil coffee shop attacker. These attacks require only temporary control of a network router and are much easier and thus more likely to happen in practice…. In many of our attacks the user need not interact with the victim web site and is unaware that password extraction is taking place. The basic sweep attack works against any password manager that supports autofill of password fields. The target user connects to the WiFi hotspot controlled by the attacker. In other words, by the time you’re looking at the fully loaded landing page, most of your credentials could already be gone – in tests, about ten passwords can be extracted per second. Sweep attacks rely on the attacker’s ability to modify a page on the victim site by tampering with network traffic. The attacks are simplest when the vulnerable page is the login page itself. However, any page that is same-origin with the login page is sufficient, as all password managers associated saved passwords with domains and ignore the login page’s path. One easy setup to attack is sites that serve a login form over HTTP (bad practice), and only use HTTPS for the submission. As of October 2013, 17% of Alexa Top 500 sites with login forms did this. I’d like to think the number is less today but I don’t have the data. Any HTTPS webpage with active content fetched over HTPP is also vulnerable (most browsers block this). Any XSS vulnerability on any page of the victim site will also work (even if the login page is served over HTTPS). In fact, an XSS vulnerability anywhere on the site enables the attack without even needing a rogue WiFi – so long as the web attacker can lure the victim into visiting a site the attacker controls. Broken HTTPS connection (e.g. bad certificates) also lead to vulnerabilities as an attacker can serve the modified login page using a self-signed certificate. The browser will complain, but the user will often click through the warnings (especially when they occur as part of logging onto a WiFi network – or so they think). A special prize goes to embedded devices which serve login pages over HTTP expecting to be on a private network protected by WiFi encryption, or (e.g.,) home routers that serve login pages over HTTPS but use self-signed certificates. What if your password manager doesn’t autofill? All of the attacks described thus far take advantage of automatic autofill password managers to work when the user does not interact with the login form. However, the exfiltration techniques we described work regardless of how the login form was filled. If the user’s password manager requires user input to fill password and an attacker can trick the user to interact with the login form without them realizing it, the same exfiltration techniques can be used to steal the password as soon as the password form is filled. The authors describe a clickjacking attack that can work in this scenario – although of course we are now limited to stealing only one password at a time. A number of password manager behaviours beyond simple autofilling help the attacker, these mostly seem to fall into the camp of password managers trying to be robust to changes in site implementation details. The following table provides a short summary, see section 2 in the paper for the longer explanation regarding each column. The main proposed defence is secure filling, which requires a modified browser (and modified password managers to work with the modified browser). Note this would also mean, for example, that we need to treat initial registration pages specially as they often include client-side validation of password strength (requiring js access). We disclosed our results to the password manager vendors, prompting several changes to autofill policies. Due to our findings, LastPass will no longer automatically fill password fields in iFrames, and 1Password will no longer offer to fill passwords from HTTPS pages on HTPP pages. There’s a recent and relevant post from Khad Young at 1Password explaining why 1Password doesn’t offer autofill capabilities that also discusses sweep attacks. Great article. I would definitely like to see a revisit with current password manager builds and os versions to see if the vulnerabilities have indeed been countered. I should also add in answer to your question that the authors of the original paper informed the developers of the tested password managers well before the paper was published. For those that were vulnerable to the described attack, fixes were put into place swiftly (against the specific exploits). Often within days of the reports. How does LastPass currently hold up on Android? Password Managers like LastPass should notify the user that they have disabled autofill on any page they detect a possible vulnerability on. I was at USENIX Security when David Silver presented this paper, which confirmed something that has been central to the design of 1Password from the outset We keep people in the loop. We see the web and web pages as hostile environments, and so we have designed our browser extension to be able to do and know only the minimum that it needs to do its job. But there are two kinds of phishing sites or pages. Those that are designed to fool humans and those that are designed to fool password managers. The former, most password managers do a really good job at defending against. But there may still be rare cases where we fail to protect people from what they would also fall victim to without using a password manager. The latter – the content that is designed to fool password managers – are typically never seen by humans (these may be injected invisibly into pages). These are the sweep attacks that David and colleagues described. It would be bad for 1Password to fail to prevent a phishing attack that someone might otherwise be a victim of, but it would be terrible to enable a phishing attack that people would not otherwise be a victim to. And so in designing 1Password we fully recognized that password manager holds a lot of very sensitive data and so it will be a target of attack, and the web browser where some of those attacks will come. Our decision from the outset to never allow automatic autofill was part of this. We weren’t thinking about trying to defend against some specific sort of trick, but instead we sought to defend against the entire category by insisting that a human must instruct 1Password to fill a page. As a long-standing 1Password user, thank you!